Kangertech has delivered their all-new and substantially improved Aerotank Mini for review here to Vape On Watt Reviews. This has been a much-awaited product launch and talked about in the chat rooms & forums over the last few months before its official release. I’m pleased to say that people are going to be somewhat impressed, both by its design features, and performance output compared with the Mega. The first thing that struck me even before I opened the outer wrapping, was the clean design of the box, easy to understand quick start guide included on the back, and most importantly of all, their new unique security code sticker and serial number printed on to the box underneath the cellophane wrapping, as I have already mentioned in the Aerotank Mega review. To check the authenticity of your new Kangertech product, just apply a droplet of water to the Kangertech Logo, and it should disappear. Dry the wetted logo with a cloth and it will reappear again. Kangertech has also included a sample of the authentication logo on a sticker inside the box. These two methods will help you confirm that you have purchased a legitimate Kangertech product rather than the all too familiar cloned copies. Also please be sure to check the warranty period should it be included with this device before purchasing. 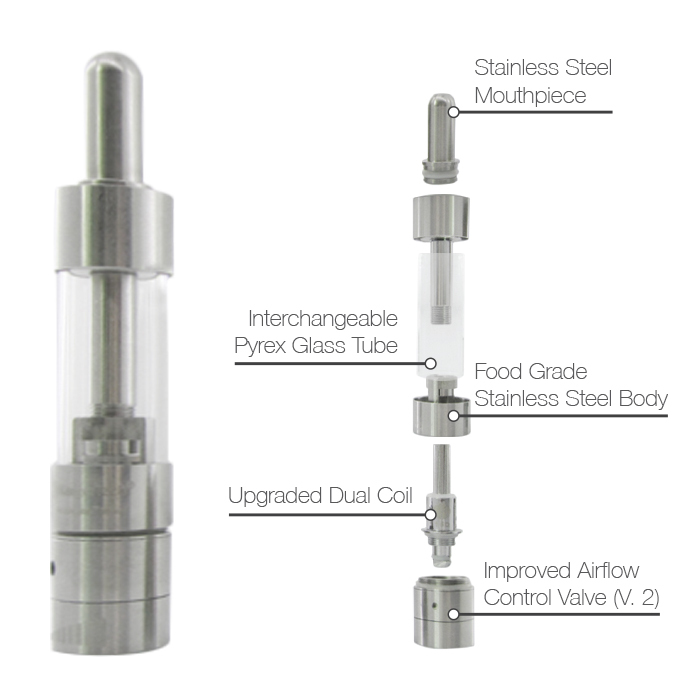 The Kangertech Mini comes complete with One Aerotank Mini fitted with the Pyrex glass body, one food grade stainless steel tube, both of which are designed to be interchangeable holding 1.3ml each. One 510 drip tip, and Two 1.5 ohm upgraded dual coil atomizer heads. 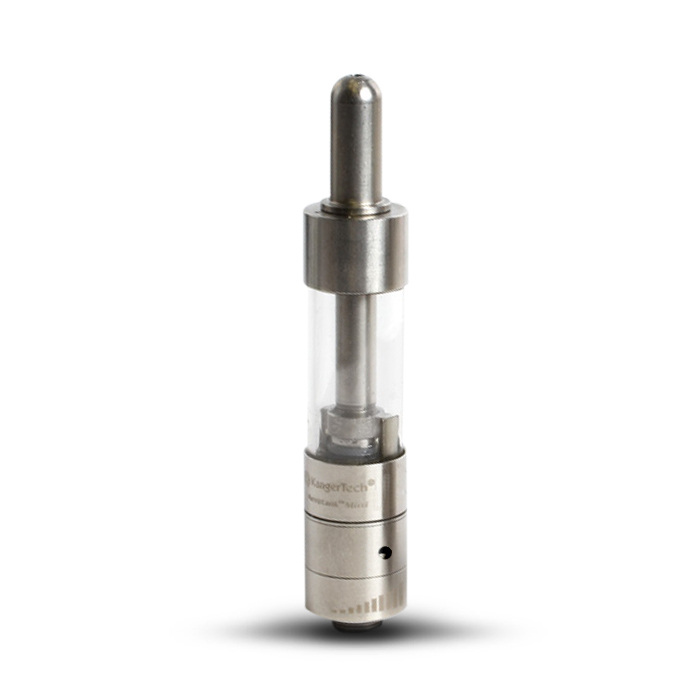 Kanger also supplies their upgraded dual coil atomizer heads in 1.2ohm & 1.8ohm configurations respectively, along with an easy to follow instruction booklet. The overall length is 60mm with a diameter of 14mm. And the weight is only 90g. The R&D team has clearly spent many late nights working on a new replacement head design from the one they have been using for some time now, along with the inclusion of a new Version 2 Airflow control valve. The overall aesthetics of the new Mini are appealing to the eye in both the glass and stainless finishes. The inclusion of an all stainless steel tank made from SUS 304 stainless steel is a nice addition, adding to the solid look and feel of it. The air control ring is another clever and useful addition that allows for balanced adjustment of the air intake, as this is a bottom fed tank. The airflow ring is situated just above the thread for unscrewing or attaching the tank to a device, you will be pleased to know that Kanger has made the control ring smooth but firm, so slippage is unlikely to occur. A suggestion for using this is to try a smaller opening when vaping thicker E-liquids and increase it for thinner liquids as a rough guide. Remember less air flow will create the sensation of a tighter draw, and a larger airflow will create that of an airier one. If in doubt adjust the airflow ring until you find the balance that best works for the juice you are using at the time. For the purpose of this review, I attached the Aerotank Mini to the Kanger EMOW ( Reviewing soon) and the Vision Spinner V2. E-Liquids where provided by Midas. The fitting of the tank on both was good and complimented both either in the glass, or stainless finishes. It would nice to have a selection of colours in the Pyrex glass as you have for the Mega, something I hope Kangertech will introduce at a later date as this is going to be a very big seller in my opinion. I made a direct comparison in this review with the Aerotank Mega, as I wanted to see how their performances compared. Flavour reproduction is excellent, and you will be very hard pushed to tell the difference between the Aerotank Mini and the Mega for tasting the flavour of your juice, which really did surprise me, as I was expecting a noticeable difference between the two. How very wrong! Vapour production was immense, so don’t be in the least bit surprised by its performance as I was. 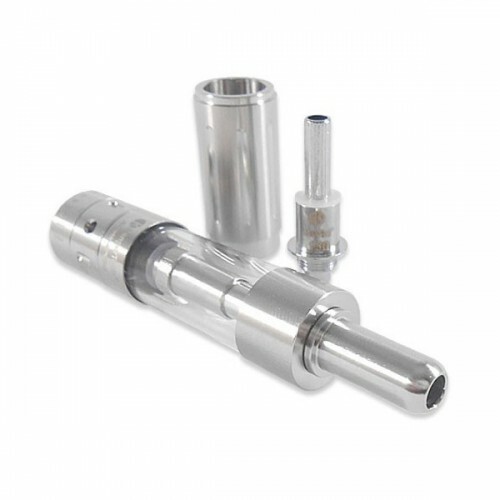 The drip tip again is very comfortable to use just like its big brother and has the right sized bore as well. Kangertech has again pushed the envelope even further with the introduction of their all new Aerotank Mini, with its new design features, redesigned coil, build quality, and stylish appearance. Like the Mega, the threading on this tank is silky smooth as well. Vapour production is excellent, and the flavour reproduction up there with the very best on the market at the time of writing this article. 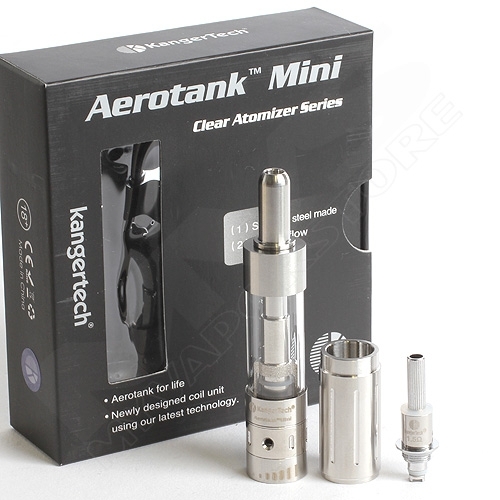 Quite simply, you cannot fail to be impressed by the performance of Kangers Aerotank Mini. Price range is currently around the £20.00 sterling US$ 30.00 mark. And remember this includes the interchangeable Stainless steel tank as well. For further details on this product, and to enter your unique product security code to identify its authenticity, contact Kangertech directly or your nearest stockist. 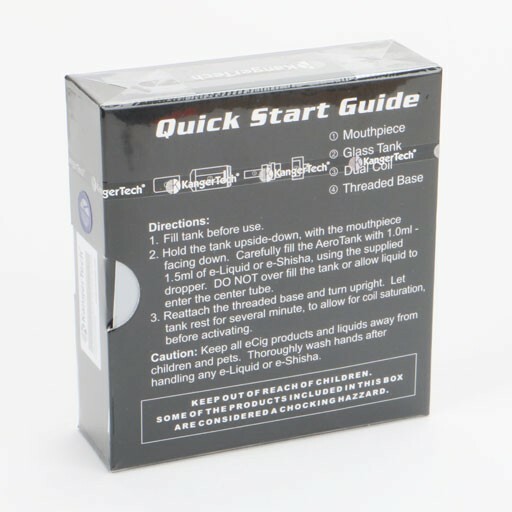 I have recently bought a kangertech aerotank V2 and subtank, however both boxes did not have the wetted logo sticker on it. I did enter the ID number and the kangertech website tells me that it is a authentic product. Does each box have to have the sticker to prove it is a authentic product or the ID number is more important? I suggest emailing them directly for a response. I had a fake product and they emailed me back rather quickly. Excellent ce petit guide ! J’ai commence9 e0 vpoater en janvier dernier et je n’ai pas touche9 une clope depuis ! La techno des ecigs e9volue vite, je viens de me payer une itaste et je de9couvre le voltage variable (assez simple e0 utiliser finalement !). Merci pour votre blog !